Thank you for your interest in becoming a part of the Telluride Yoga Festival family! We are looking for companies that align with our values, speak to our clientele, and desire to help us create a vibrant, fun, well rounded, festival community. 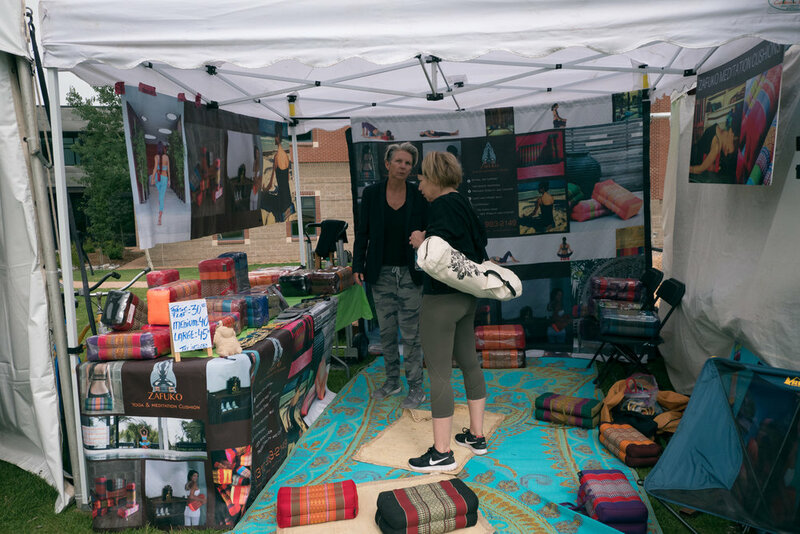 We are excited to offer all of our vendors a prime location at our festival campus at the Telluride High School & Palm Theatre in downtown Telluride located at 721 W Colorado Ave, Telluride, CO 81435. 6 of our 7 class and workshop venues are located here along with our registration area, kids zone, community tent, special events and more. 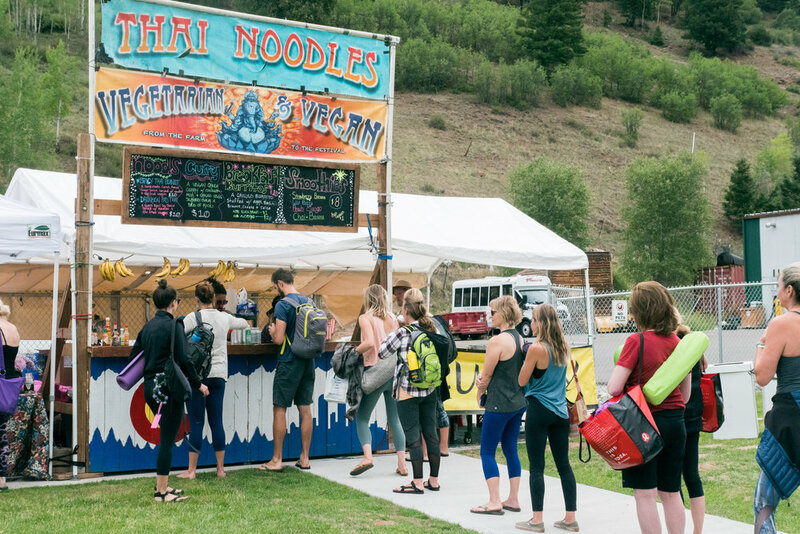 We offer both indoor and outdoor vending opportunities at the Shanti Marketplace and the Mountain Air Marketplace. Both vending areas are open to the public along with approximately 1000 yogis daily. Vending runs for 3 days: Friday 9-6pm, Saturday 9-6pm and Sunday 9-4pm. 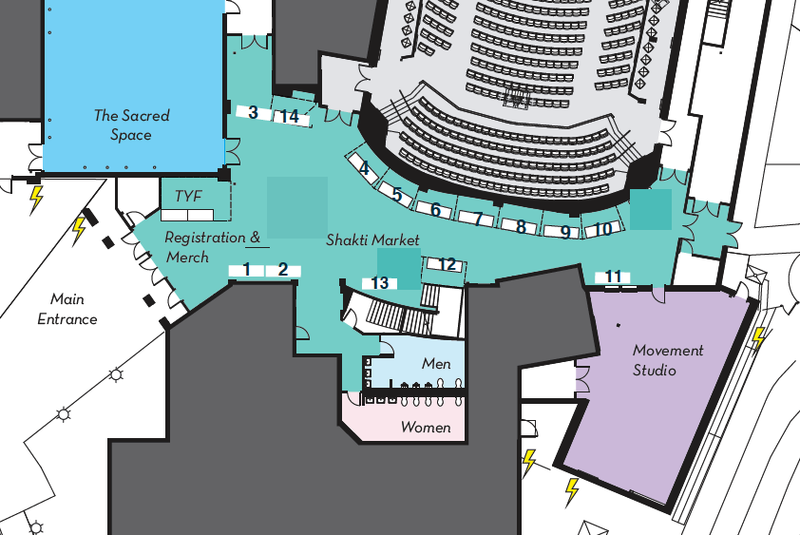 About: The Shanti Marketplace in the Palm Lobby of the Telluride High School/Palm Lobby is an indoor vendor area and is the corridor to all of our venues - inside and out. Our TYF registration and merchandise area is at the entrance of the Palm Lobby with indoor vending in the open lobby area leading to the back yard where our tented venues and more are located. Setup: 1pm-4pm on Thursday, June 27th. All booths must be set up by 4pm for inspection. A specific load-in schedule will be provided prior to the festival. WiFi/Processing Credit Cards: The school has a secured WiFi network. We recommend you have data on your smart phone for processing credit cards as a back up however. Electricity: If you require more electricity of any kind, please specify your electrical needs in detail on your application. Retail booths will be limited to one 20 AMP circuit and only if specified in your application. Requirements/Details: Indoor Vendors will be given an approximate 8'x8' area with (1) 8-foot table, linen and 2 chairs. About: The Telluride High School/Palm Theater is our festival "hub" with 6 out of our 7 venues located here. Outdoor vendors line the path to our 3 large tented venues, our community tent, and to AiReal yoga and Kid's Yoga Camp. Number of Vendors: 20 outdoor merchandise vendors and 4 food vendors - each vendor is given space for a 10x10 pop up. Setup: 10am-2pm on Thursday, June 27th. All booths must be set up by 4pm for inspection. A specific load-in schedule will be provided prior to the festival. Security: We will provide security outside business hours for our vendors Thursday, Friday and Saturday night. Food Vendor Electricity: For food vendors, you have a max of 20 AMPS and please keep in mind the electrical distribution is limited. Anything that can run on propane (grills, fryers, steam tables, ovens, etc.) should do so. Anything that is electric, please do your math on wattages. All your electrical equipment has a tag on it stating its wattage consumption. (Watts/120 Volts = AMPs) Example: If you have 5 each (100 Watt) heat lamps plus 3 (1,500 Watt) electric steam tables, that equates to 500 Watts + 4,500 Watts = 5,000 Watts. 5,000 Watts divided by 120 Volts (US Standard) = 41.66 AMPs, which is 21.66 AMPs more than the 20 AMPs you are permitted. Weather: Weather can change quickly in the mountains; this is a rain or shine event. No refunds will be made due to weather. *Electricity available for additional fees which vary depending on need, must be indicated on application. Your space is not guaranteed until your application is accepted and full payment is received. Outdoor vendors are required to bring their own 10’x10’ tent. Additional table and chairs can be rented for $20/table and $5/chair. Outdoor vendors are not allowed to stake into the ground anywhere on the grounds, please bring weights (cement) or water jugs/barrels. Securing the tent is the responsibility of the vendor. Vendors agree to report sales and submit 8.65% of total gross revenue to TYF for sales tax. Cancellation 60 or more days prior to the event will result in a $200 cancellation fee. After 60 days, fees are non-refundable. Space is limited and we accept vendors on a rolling basis. Deadline to apply is April 1, 2019. Apply to be a 2019 Vendor Now! This is to ensure that we have diversity without much overlap. Please see electrical info to calculate your needs. Thank you! We will be in touch shortly. If you have immediate questions, feel free to email Jenny directly at jennifer@tellurideyogafestival.com.